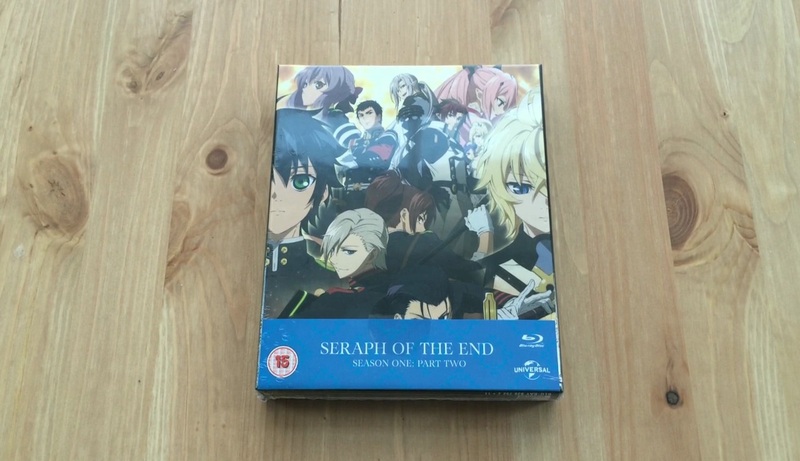 Universal Pictures UK continues it’s anime distribution with their latest release Seraph of the End – Season 1 Part 2, otherwise referred to as Seraph of the End: Battle in Nagoya; and just like their previous releases it arrives in the form of a Collector’s Edition set. 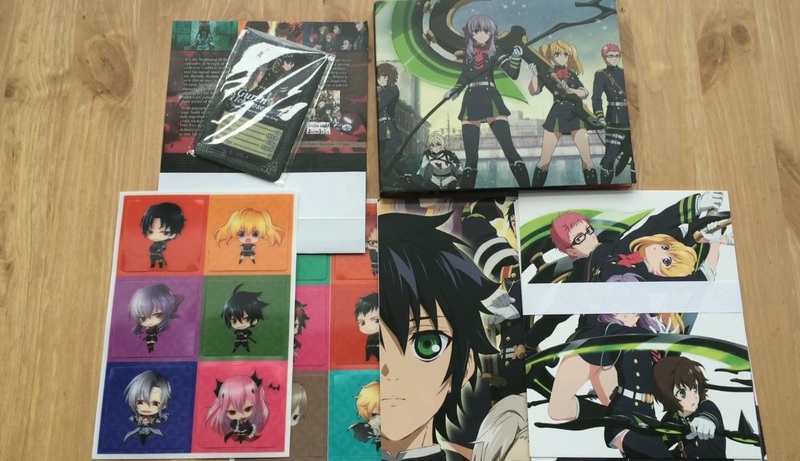 Well just what can you expect to receive with this Collector’s Edition release of Seraph of the End – Season 1 Part? Well let’s take a look in our unboxing! For those familiar we have already taken a ‘quick look‘ at the contents of this Collector’s Edition release, namely the dici-pack packaging and the art cards; but in this unboxing we will take a look at the whole packaging. To start with this second half of the series, along with its collector’s content, comes packaged in a top-loading chipboard art box and mimics the style, design and quality of the previous releases by Universal Pictures UK. The difference, other than artwork, is that the box is a lot thinner and this is due to the Art book (or Guide Book) being smaller than the previous one. Art box size aside inside we have a Digi-Pack packaging holding the two discs, in this case the Blu-ray versions, as well as the Guide Book, numerous character art cards, four character information cards, a poster and a selection of lenticular styled stickers. The Digi-Pack packaging once again feels rugged and features a nice variety of artwork on both sides of the packaging and the inclusion of various physical content (art-cards, stickers, posters) make this set feel more special than other Collector’s Edition sets released by other distributors. The centre piece of this set, other than the disc content, is the informative guide book. The guide book isn’t particular big – it’s only around 40 pages or so – but it features a well balanced range of information and character illustrations. It’s a lot more than I initially expected to receive but each page is filled to the brim with content. what’s more interesting is that the guide book also feels more durable and rugged than those provided with Anime Limited sets. Its hard to explain; but it just feels like it was produced to a higher degree – which the same can be said for the entire set. The final piece of this Collector’s Edition release is of course the Blu-ray Discs and their content. 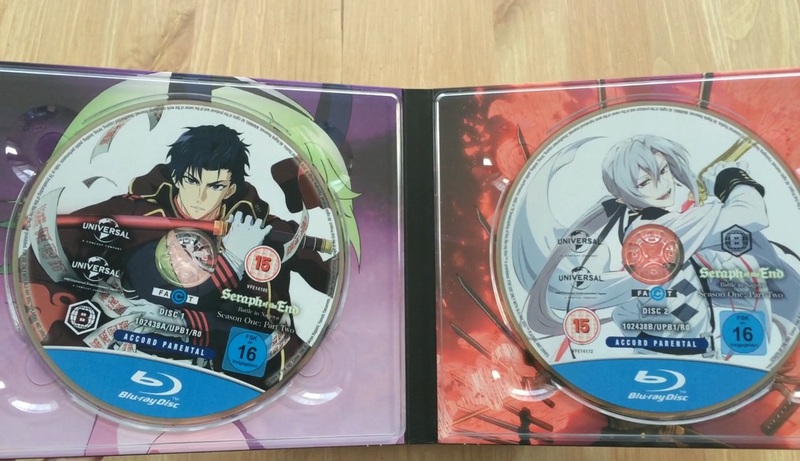 For start with each disc features a single piece of character artwork surrounded by numerous logos (such as BBFC, FSK, Universal Pictures logo and so forth) as well as the Blu-ray Banner. It’s slightly intrusive, and different to the norm on what we expect from anime releases; but this is Universal Pictures standards of releasing Blu-ray discs so we (as fans) will just have to deal with it. Personally it does not bother me, as it feels like a true inclusion to the Universal Pictures release pattern, but I understand it can be disappointing to fans who like clean presentable artwork on the discs. In terms of disc content then, as illustrated in our review, twelve episodes – with six episodes per disc – are included with each episode presented in English, German and Japanese audio with relevant subtitles. In regards to bonus features then you’ll find a selection of promotional assets (Trailers and TV Clips) , clean opening and closing animation sequences for this half of the series and mini-episodes that give an alternate spin of the events of the series. Once again Universal Pictures UK brings us a truly stunning Collector’s Edition that screams premium high quality throughout, especially in regards to the chipboard art box and it’s guide book; and while some minor differences can be seen – such as the size of the box or the colouring of the text on the spine – it’s a set which any anime blu-ray fan should own. 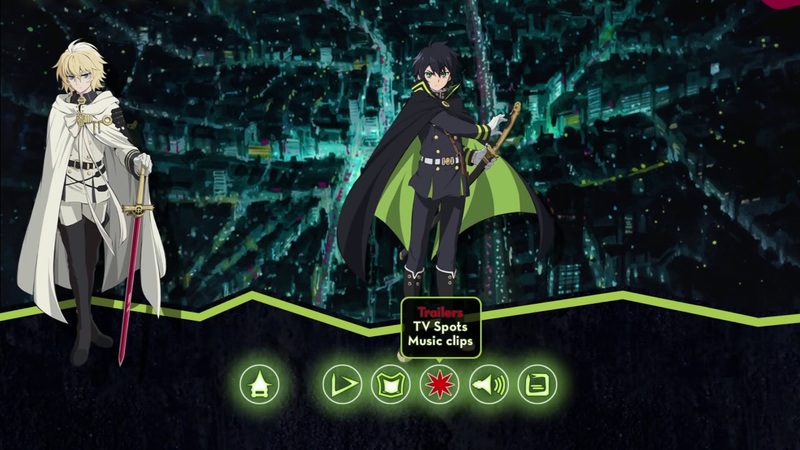 Seraph of the End – Season 1 Part 2 is now available within the UK as a Collector’s Edition Blu-ray and Collector’s Edition DVD set.